A Dark Blue Jungle Glory perches on a leaf. 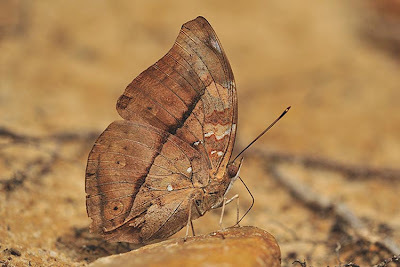 Its cryptic undersides will render the butterfly well camouflaged when it forages amongst dead leaf litter on the forest floor. In the first part of this series, we saw how some butterfly species have evolved to mimic their unpalatable cousins for protection against predators. This phenomenon of protective colouration gives the mimic a better chance of survival in the field, and in particular, females of the species, a higher odds of survival long enough to lay her eggs for the next generation. 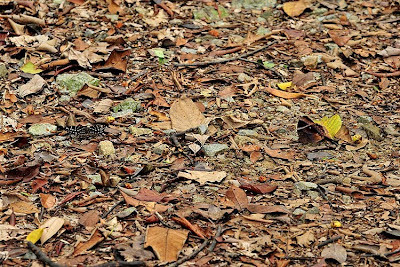 A typical forest floor covered with dead leaf litter and twigs. 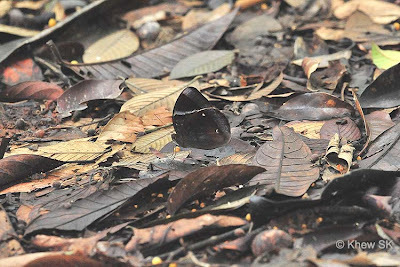 Can you spot the two butterflies feeding on rotting matter on the forest floor? 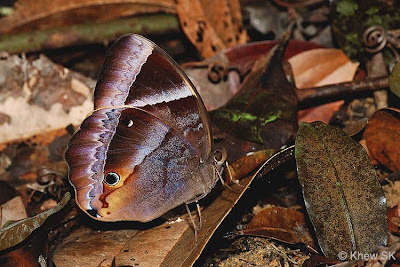 In this part, we look firstly at adaptive colouration of butterflies based on the need of concealment or crypsis (defined simply as a strategy to reduce the probability of detection). This principle of concealment throught colouration was discussed by AR Wallace as the "visual similarity between animal and its background". This theory has been explained by many examples in the animal world - from the white polar bears that live in essentially white snow-covered habitats, to the colour differences in marine animals like sharks where its dorsal and ventral colour differences help in concealment of its presence in its environment, depending on whether viewed from above or below. Saturns feeding on rotting fruit. How many can you see in the picture? There are many examples in butterfly evolution, where cryptic colouration has been employed to render the butterfly 'invisible' to predators. This is done via disruptive patterning and colours to resemble its surroundings. The objective here of course, is the theory supporting the notion that predators 'cannot attack what the cannot see'. 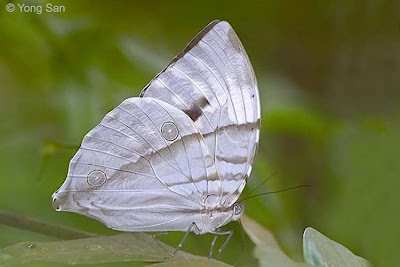 Cryptic colouration, coupled with the behaviour of the various butterfly species in their preferred habitats is one of their survival strategies to avoid being predated upon for as long as possible. 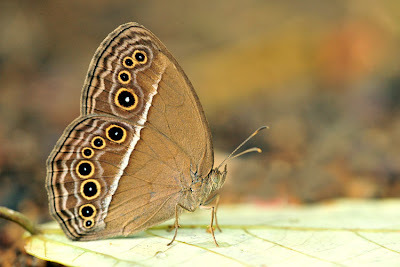 In what is described as "startling patterns", prominent eyespots in butterflies have been shown to divert the attention of inexperienced avian predators. 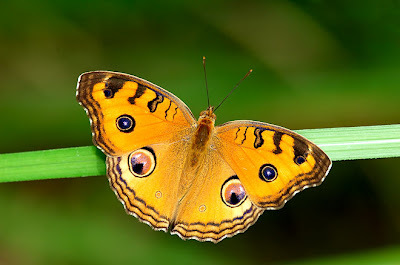 In his experiments with the Peacock Butterfly (Inachis io), David Blest (1957) found that this 'startle display' made young birds back off, even if for a moment, giving the butterfly that fleeting moment to escape. Locally, related species like the Junonia probably have the same effect on predators. 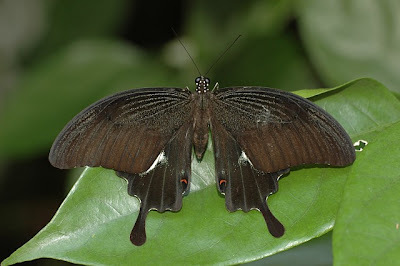 Another example of this strategy is the Great Helen (Papilio iswara iswara). 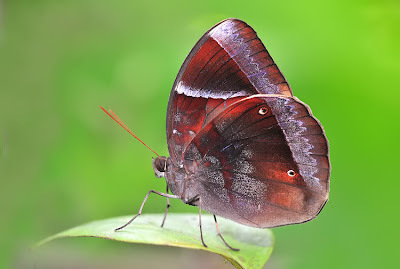 At rest with its wings opened flat, the butterfly's forewings conceal the white patch on the hindwings, making it appear totally black. But when started, it flashes the white patch to 'dazzle' a would-be predator momentarily, giving it a precious moment to make good its escape. Many species of butterflies also display an array of eyespots - some on the uppersides and some on the undersides of the wings. Eyes or the display of eyes, tend to make a predator wonder if there are indeed any other animal lying in wait for it. A momentary hesitance makes a difference in whether the butterfly escapes or ends up as lunch. Eyespots on the outer fringe of the wings of some Satyrinae may cause some inexperienced predators to hesitate as they check out the eyes. In some species like the Mycalesis, the spots are always ranged along the outer margins of the wings, never close to the body. 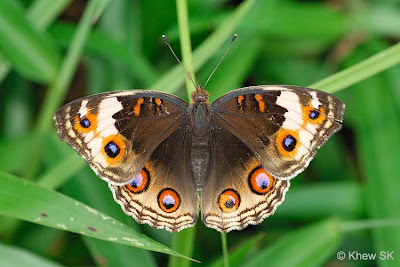 Even if a predator decides to attack the 'eyes', it will take out a part of the butterfly's wing that may not be critical, allowing the butterfly to escape with its life, albeit without a small piece of its wings. 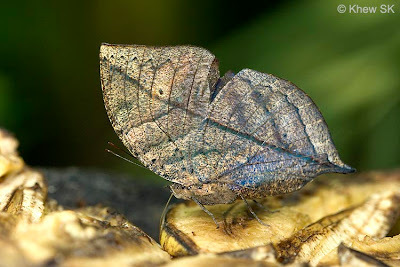 The Leaf Butterfly is a pretty iridescent blue above with orange bands, but when alarmed it settles with its wings closed to resemble a dead leaf. As an alternative to purely employing cryptic patterns to camouflage itself, some butterfly species employ the strategy of masquerading as a non-palatable part of its environment, or at least 'pretend' to be something else to conceal itself. 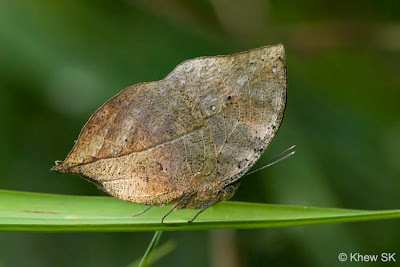 The famous Leaf Butterfly (Kallima limborgii) in Malaysia and (Kallima inachus) in Thailand and northwards, and (Kallima paralekta) in Java and southwards, demonstrates this method of concealment. 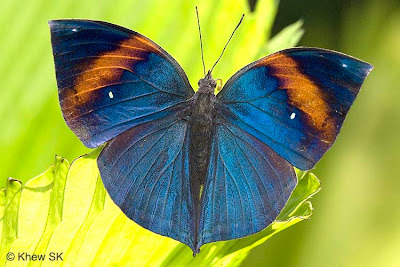 On the upperside, the butterfly is a rich purple blue, with a broad orange subapical band on the forewing. The underside very closely resembles a dead leaf, complete with a midrib, petiole and even patches of fungal growth on the leaf! The undersides of the Autumn Leaf and Saturn also resemble dead leaves. Note the colourful orange upperside of the Autumn Leaf when it spreads its wings to sunbathe. 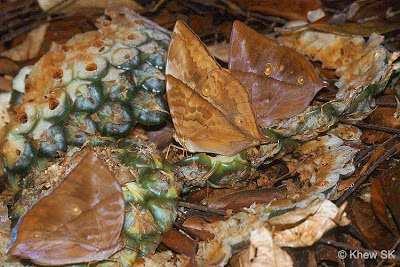 In Singapore, several other species like the Autumn Leaf (Doleschallia bisaltide) and to a certain extent, the Saturn (Zeuxidia amethystus) are less successful examples of trying to masquerade as dead leaves. 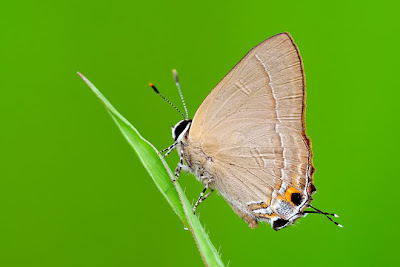 Many Lycaenidae are excellent examples of employing the strategy of creating 'decoys' whereby a predator is fooled into attacking the less vital parts of the butterfly. 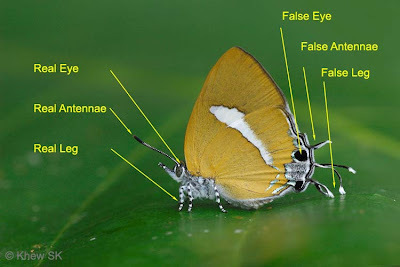 These species have evolved to create a 'false head' whereby the tornal area of the hindwing featuring a prominent 'eye' with one or more pairs of tails making them appear like antennae. 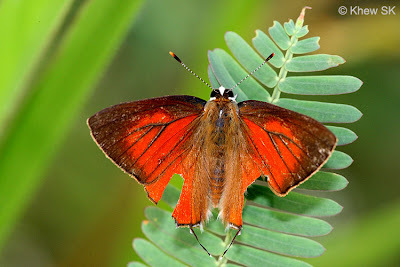 Indeed, in the field, many of these species also accentuate this part their hindwings by moving them up and down when at rest, causing the 'false head' to be more active and calling attention to the 'wrong side' of the butterfly to a would-be predator. Underside of the Common Red Flash featuring false eyes and antennae. Below is a shot depicting a possible survivor of an avian attack with the hindwings showing bite marks in a previous encounter. The filamentous white-tipped tails of many species are also very 'lively' when wafted in a breeze, as are the long and white tails of many of the long-tailed Lycaenids. 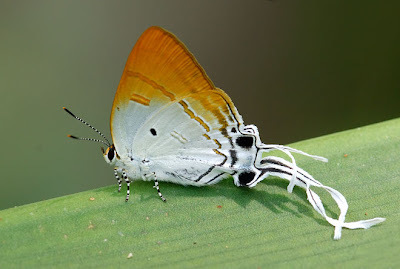 Coupled with the patterns, colours and tails, these butterfly species create a 'decoy' false head so that a predator attacks a less vital part of the butterfly, giving it a chance to survive and escape, but without a piece of its hindwings. 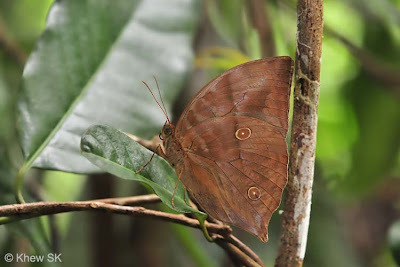 An Ambon Onyx showing off its "false head"
So now we see, despite being virtually harmless and unable to defend themselves with any aggressive 'weaponry', natural selection has allowed butterflies to adapt and evolve other strategies to even the odds of survival in the field via the colours and shapes of their wings, and their behaviour in their preferred habitats.